The Sisters of Mercy set up Providence Row in Spitalfields back in 1860 as the first non-sectarian shelter to offer support to the homeless, and I was very curious to meet the Sisters still working here today because I have such respect for the honourable undertaking they have pursued over all these years. The very name of this place, Spitalfields, is a contraction of “Hospital Fields”, referring to the Hospital of St Mary set up as a refuge here for the vulnerable in 1197 by Walter and Roisia Brunus. Regrettably, the transitional nature of the area, situated between the wealth of the City of London and the poorer outer boroughs, has required the existence of such a refuge for nearly a thousand years. This could change if the government achieves its declared ambition to end homelessness by 2012, but in the meantime the essential work of caring for the growing numbers of dispossessed goes on here in Spitalfields. 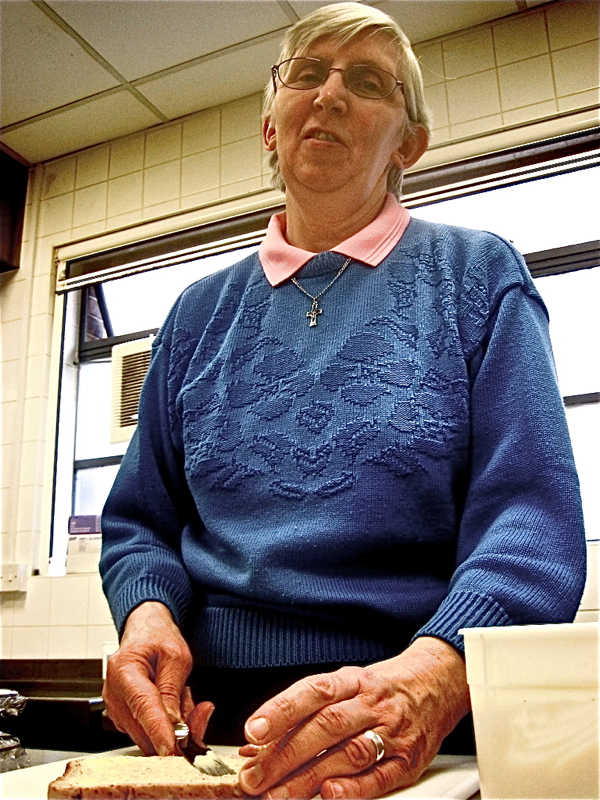 Sister Bridget (above) works in the kitchen and Sister Bernadette (below) runs the laundry at the Providence Row Day Centre on Wentworth St. They work as volunteers at the centre, now run by an independent charity, where every day two hundred homeless people arrive for breakfast. Nowadays, as well as providing immediate relief like food and laundry, the centre offers long-term support – everyone that turns up begins a conversation to get them back into permanent housing and employment. Recently, around half of those arriving at Providence Row are Polish or Romanian, legal economic migrants who are victims of the recession, ineligible for benefits, they quickly become destitute without work. Sometimes the solution can be as simple as providing transport home to Poland and Providence Row works with a Polish charity to provide this lifeline. There is a hush in the centre around midday, once most of the visitors have returned to the streets with their pack lunches and it was at this time I was able to enjoy a quiet moment with the two Sisters. These bright-spirited women recited their life stories to me quickly without embellishment, all the time cradling modest sandwich lunches wrapped in cling film. After years of education and preparation, each has devoted their entire life to hard work in the service of others without any reward beyond the satisfaction of the task itself. Although they gave up wearing habits fifteen years ago, they still pursue an ascetic existence based upon their three vows of poverty, chastity and obedience. Sister Bernadette sums it up for me,“Instead of getting married and having children, these are our children”. Sister Bridget joined the Sisters in 1966 in London and after working first in Dorset came to Spitalfields sixteen years ago. “I like helping people”, she says lightly, by way of understated explanation – but you know it is her absolute vocation. One hundred and fifty years after they set up Providence Row, there are just four Sisters in Spitalfields now, whereas twenty years ago there were eight and without new recruits their days here are numbered, because the appetite for this life of complete sacrifice has gone from the world. 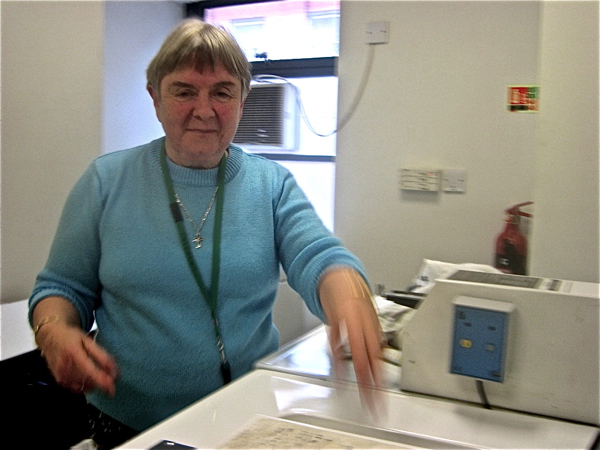 Hailing from Dublin, Sister Bernadette entered the order in 1969 in Leamington Spa and worked first in Birmingham with children from broken homes before being sent to Spitalfields fifteen years ago. “I always wanted to work with homeless people ever since I was child”, she explains simply. Sister Bernadette was enthusiastic to show me the cramped room where she spends all her days moving clothes between two machines and two driers in an endless sequence of laundry. She had only managed ten loads of dirty laundry that morning, she says. Not so many among two hundred clients. “I could do a hundred loads of laundry if I only had the machines!” she adds enthusiastically. “Quite understandably, sometimes they get angry with you if you can’t do their laundry and I try to be as polite as I can” she confides. “But there’s great respect for the Sisters” she qualifies, then with a wry smile adds, “An Australian once said to me, if anyone comes near you or lays a hand on you, call me and I will deal with them!” and she rolls her eyes in amused acknowledgement of the sometimes challenging nature of the work. For the Sisters, their faith is expressed through an energetically practical ministry, getting up early (5:30 or 6:00) and doing what needs to be done – because somebody has to do the washing for people without homes, year in, year out, and send them off with clean clothes, a packed lunch and a new pair of socks to continue life’s journey in the hope of better times. In spite of a grinding routine that many would characterise as mundane, there is nothing cynical or weary about Sister Bridget or Sister Bernadette. I have always believed in the notion of everyday heroism and these two enigmatic women exemplify it for me. Bravo! Great post! I always find something very worthwhile at Spitalfields Life. Never knew it came from Hospital Fields. Thx! I had the great privilege in nineteen-seventy-something of visiting the Sisters of Mercy at Spitalfields and meeting there a Sister who knew a distant cousin of mine and was at her bedside when she died in 1947 at the age of one hundred. My cousin (born Florence Locks, in Hackney) was Sister Mary Evangelist. She and one of her sisters were both Sisters in the Order. The Sister I met showed me a History of the Order which my cousin Sister Mary Evangelist had produced in beautiful illuminated caligraphy. It was a breath-taking piece of work. I wonder if you can tell me where the History is kept now. It is a precious and important work. I found this so moving and quite humbling. Well done for ‘unearthing’ the connection. Have you passed info onto Stephen Locks for the family Tree info? How far are you from Bardwell, near Bury St Edmunds. I may be up there early this coming week. I have just published ‘A Living History’. This covers 100 years of our local church, St Peter’s – see the Wheathampstead History Webb site. Thirty years of research and 4 months dedicated writing – in the bood! Well done to The Sisters of Mercy. My great grandfather was looked after by these nuns in Spitalfields in 1901. He was homeless and aged 74.
and thank you from me too! Me and my family were taken into Providence Row (Crispin St site) in 1958 when we had nowhere else to go. A life saver .. for us then, for others now. Different times, different stories, same needs. I see a John Driscoll listed in the 1901 census. He was born around 1843 and the record says he was born in Skibbereen, Cork. He may be my great great Grandfather and I am trying to find as much information as I can about him. I don’t suppose your records would show anything more, particularly when he died and if he had any family listed. I am in Christchurch NZ, and hope to visit in June. I cannot thank the Sisters of Mercy enough for helping my Great Grandmother and her two daughters in their time of need in 1891. I have been tracing my family tree and was so upset to see the family including the Mother Catherine Connor aged just 25 and her 2 daughters Catherine and Elizabeth aged 17 and 2 with no means to afford a roof over their heads. The good news is that they did get themselves back on their own feet after the Father died. God Bless all Who Help the Needy Without Judgement. Thank you; I enjoyed this update. I have such fond memories of Sister Paul whom I knew in the late 1970′s. I went to st. josephs r.c. convent school which backed onto the convent , we were taught by the sisters and mrs. davis , the sisters of mercy were so kind to us children .fond memories of sister gonzaga, sister ursula, sister elizabeth. they were very patient and often took us on day trips, which we enjoyed. that was in the 1950s. i lived in the area from 1948- 1963. it was a happy place to grow up never a dull moment. My name at the time of my stay at Providence Row was Thelma kollesoff, aged twelve years of age in 1945. I was sent to live at Providence Row from an orphahange. There were no cildren living at Providence Row permananately, though in my two year stay, some children came for a few days with thier parants. I went to St. Josphes School on Gun street. I for years i carried a cloud of black shame about living at Providence Row, sleeping alongside of woman who worked at Providence Row. However, the light that has shone through the black cloud all my life, was the force of Sister Elizabeth, a tall energetic nun who ran the womans shelter plus the head mistress of the school. It was she, who aranged my first ever bithday celebration on my thirteenth Birthday, i was able to invite five children from school, my birthday party was presided over by the four nuns running Providence Row at the time. I have written a book through the eyses of a child, about my life groing up in various institutions, in England during the thirties and forties, my two years living at Providence Row as a child, haunted me so much, it was the poverty of grown up people i saw every day coming in and out of Providence Row two times a day for thier bread and coco. aged Twelve thu Fourteen years of age. Thelma, I’m so glad you have good memories of Sister Elizabeth. She was the older sister of my great – grandmother and I remember visiting her at Crispin St. several times as a child. We would take Christmas presents and new clothes door the children there, though as a child I didn’t realize what a wonderful work the sisters were doing helping those in need. To Mary Pollination thank you for your mail, I will let you know when my book is published. I was very sad when Providence Row was sold, i was always hoping to get back to England and have one more nostalgic binge. However,i am pleased it is now a place for students, i know Sister Elizabeth would appreciate this. In all other schools i attended, i was a dunce, however attending school at Providence Row i excelled. After the second world war, we children from the little school on Gun Street attended a peace Mass at West Minister Cathedral, i was selected to carry the envelope of money along the isle, and hand over the money to a Bishop, i still remember the amount of money, Twenty Seven Pounds twelve Shillings and Sixpence.